Slow Cooker Chicken Carnitas Style is a lightened up version of Chipotle Mexican Grill Pork Carnitas, made using chicken thighs for great flavor! Skip the rice and serve with cauliflower rice or low-carb tortillas for a low-carb Taco Tuesday meal. Click to see the Top 20 Instant Pot Chicken Dinners! When she created this recipe for Slow Cooker Chicken Carnitas Style, Jeanette from Jeanette’s Healthy Living was thinking of her son who loves the pork carnitas burrito at Chipotle Mexican Grill, but she wanted a lighter recipe with less fat, and definitely not using the lard that Chipotle lists as one of their ingredients. I love the attention to detail used here to duplicate the flavor of carnitas while using chicken thighs, even down to frying the meat before serving for those crisp edges that make pork carnitas so good. 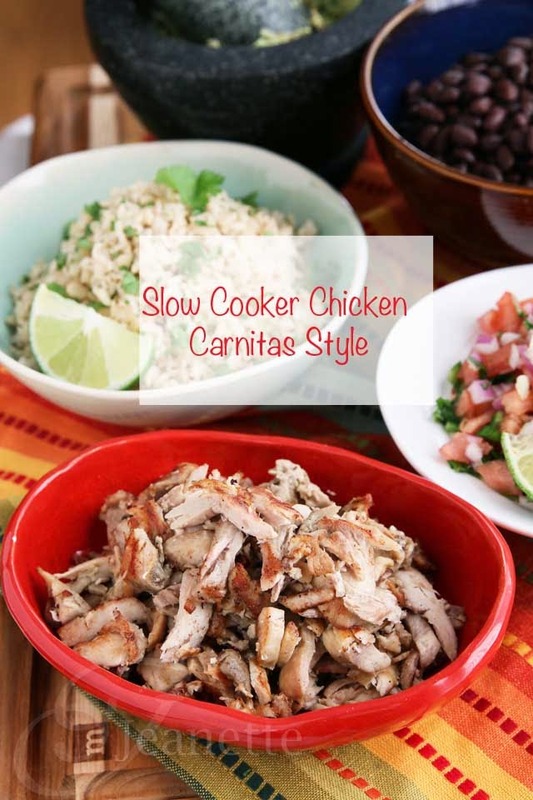 Get the complete recipe for Slow Cooker Chicken Carnitas Style from Jeanette’s Healthy Living. It's the crispy little edges that make this dish special! I love the chicken adaptation. Lydia me too; I think Jeanette hit it out of the park on this one!